The Balanced Audio Technology VK-3000SE integrated amplifier embodies simplicity without compromise. 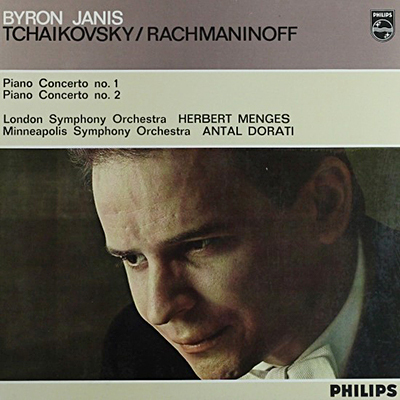 Whether it’s a studio apartment with skyline views or an expansive home with minimalist décor, even the most uncluttered living space should breathe with the life of exquisite music. Made to satisfy the world’s most discriminating music lovers, and providing effortless power in a truly compact package, the VK-3000SE delivers such splendor. 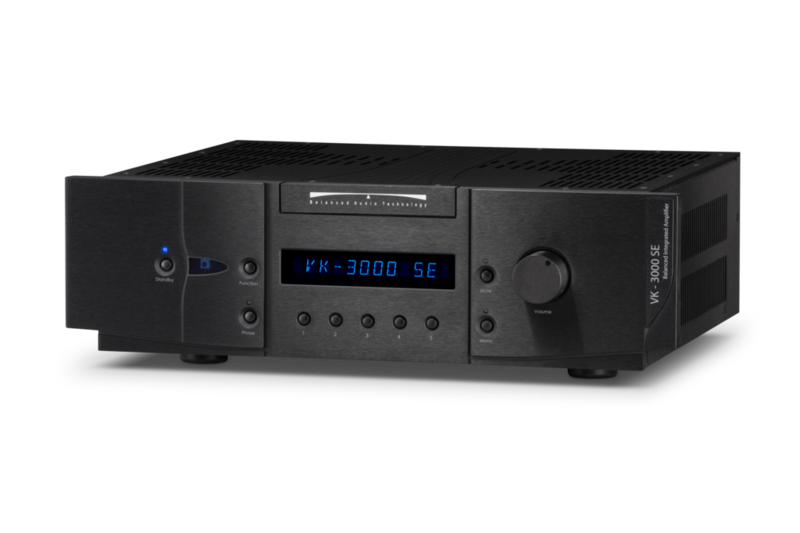 Certain to satisfy the requirements of even the most demanding audiophiles, the VK-3000SE will effortlessly serve as the nucleus of an ultra-high-end music system. 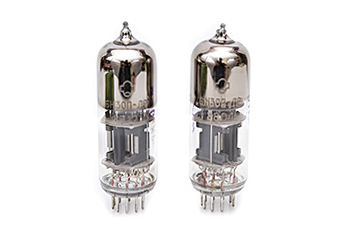 It provides a robust 150 watts per channel into 8-ohm loads and doubles this output into 4-ohm loads. Combine such ability with BAT’s vacuum-tube preamplifier section—based on the same reference 6H30 SuperTube used in the flagship REX II preamplifier—and you get sublime power matched with richly textured musicality. Incredibly versatile, the VK-3000SE can be configured to meet almost any system need. A programmable user interface allows you to easily mate the VK-3000SE with a home-theater system. Change sources, switch polarity, or fade your music with just one touch—all from the included machined-aluminum remote control. Add in the optional phono module, and you’ll obtain superb reproduction of your vinyl collection from either moving-magnet or low-output moving-coil cartridges. Use the vacuum-tube preamplifier outputs to control an amplifier in a second room. Such extraordinary flexibility sets the VK-3000SE far apart from its peers. Many integrated amplifiers offer the benefit of convenience, but little else. The VK-3000SE is different by design. Its circuitry and build maintain the uncompromisingly high caliber found in Balanced Audio Technology’s flagship components. The output stage employs the symmetrical bipolar design used in BAT’s reference VK-6200 multichannel power amplifier. The preamplifier section uses the same 6H30 SuperTube Unistage design topology employed throughout BAT’s Special Edition tube preamplifiers—right down to the paper-in-oil signal capacitors. And the user interface offers the superb flexibility and ease of use that helped BAT set the industry standard. Even the included VK-R3 remote is machined from a solid block of aluminum. To literally cap it off, the VK-3000SE features a gorgeous aluminum top cover and side panels that add to its signature look. Inside and out, this integrated amplifier possesses an impeccable pedigree. The VK-3000SE’s elegant design and technical prowess ultimately exist to serve the music. For any integrated amplifier, the crucial test is its sound, and the performance afforded by the VK-3000SE is breathtaking—and pure BAT. 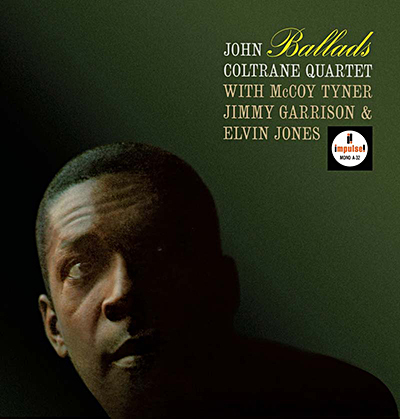 “Open,” “delicate,” “smooth,” and “powerful” immediately come to mind when describing its sonic characteristics. We can say without hesitation that the VK-3000SE is competitive with reference-level separates. At last, musical finesse and superb performance are combined without compromise in one convenient package. We invite you to visit your BAT audio specialist to experience this revelation for yourself. Remember: All you need to do is listen. Incredibly versatile, the VK-3000SE can be configured to meet almost any system need. A programmable user interface allows you to easily mate the VK-3000SE with a home-theater system. Change sources, switch polarity, or fade music with just one touch—all from the included machined-aluminum remote control. Add in the optional phono module, and you’ll obtain superb reproduction of your analog record collection from either moving-magnet or low-output moving-coil cartridges. Use the vacuum-tube preamplifier outputs to control an amplifier in a second room. Many integrated amplifiers offer the benefit of convenience, but little else. The VK-3000SE is different. Its circuitry and build maintain the uncompromisingly high caliber found in BAT’s flagship components. The output stage employs the symmetrical bipolar design used in BAT’s reference VK-6200 multichannel power amplifier. 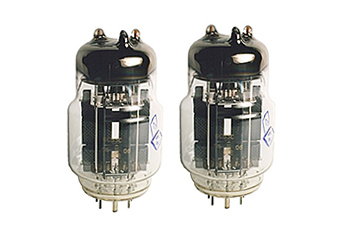 The preamplifier section uses the same 6H30 SuperTube Unistage design topology employed throughout BAT’s Special Edition tube preamplifiers—right down to the paper-in-oil signal capacitors. To literally cap it off, the VK-3000SE features a gorgeous aluminum top cover and side panels that add to its signature look. 오디오 평론을 읽다 보면 소개나 에피소드로 채운 서론이 참 긴 리뷰를 간혹 볼 수 있다. 나 역시 이런 소개 글이나 에피소드를 많이 인용하고 있다. 주로 역사가 오래된, 예를 들어 JBL이나 마크레빈슨과 같이 스토리만 써도 지면이 모자랄 정도로 역사를 가진 업체라든가, 제품의 독특한 개성이나 창업스토리 또는 개발자가 스타급 엔지니어라든지 하는 등등의 이야기거리가 있으면 본 내용보다 이런 이야기거리가 지면을 채우기도 한다. BAT 는 역사가 그리 오래된 오디오가 아님에도 이런 글들이 참 많이 있다. 그만큼 독특하고 이야기 거리가 많은 오디오이다. 우선 최대한 짧게 요점만 정리를 해볼까 한다. 사명 자체가 번역을 해보면 ‘발란스 음향 기술’이다. 그만큼 밸런스 회로에 기반을 두고 있고, 그 우수성을 이야기한다. 어려운 공학적 용어가 난무하고, 하이엔드 업체 중에 언밸런스만 사용하는 업체도 많아 그다지 설득력이 강하지는 않다. 디자인도 이야기 거리가 된다. 제품개발, 음질을 위해 외적 투자를 최소화한다고 주구장창 같은 디자인만 찍어낸다. 이 제품 역시 프리앰프의 디자인을 동일하게 사용하고 있다. 이런 경우 오디오 업체 중에서는 그다지 어렵지 않게 예를 찾아 볼 수 가 있다. 구형 사용자 저가기 사용자에게는 아쉬울 것이 없지만 반대의 경우 조금은 서운한 일이기는 하다. 하지만 서운해 할 필요는 없다. 지금 쓰시는 것도 얼마 뒤에는 구형이 되는 것이 모든 공산품의 운명이다. 하지만 가장 많이 이야기 되는 BAT의 이야깃거리는 두 가지이다. 6h30, 6c33 진공관, 그리고 공동창업자인 빅토르 코멘코의 스토리이다. 초기에는 추락한 미그기에서 발견된 6c33을 활용한 파워앰프가 주 이야기거리였다가, 나중에는 슈퍼 진공관이라 불리는 6h30을 활용한 프리단에 주목을 한다. 역시 소련제 군용 진공관으로 뛰어난 특성과 수명을 가지고 있어 6c33 출력관을 활용한 파워앰프처럼, 6h30을 초단관으로 활용한 프리앰프가 꾸준하게 많이 나오고 있다. 게다가 가격도 싸고 구하기도 쉽다. 굳이 비유하자면 오디오에 있어서 칼리시니코프의 AK소총으로 생각하면 될 듯 하다. 그렇게 많이 사용되는 진공관인데 왜 유독 BAT에서 이 진공관이 강조되는 것일까? 여기서 빅토르 코멘코가 등장한다. 화려한 기술자로서의 이력이 따라 붙고 기술적인 특허 내용이 서술되지만 나는 어디선가 읽은 이 한 문장이 가장 설득력이 있어 보인다. 빅토르는 구 소련시절부터 군수 기술자로 이 진공관을 가장 많이 다루어 본 엔지니어이다. 나로서는 이해하기 힘든 공학적인 서술보다 이 인문학적 해석이 가장 마음에 와 닿는다. 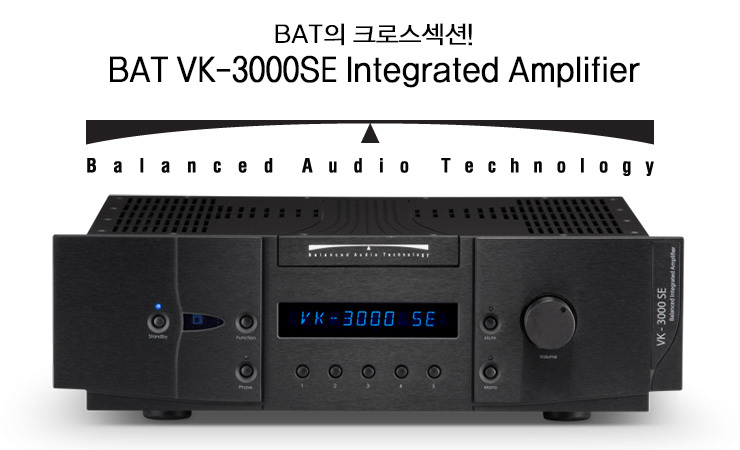 그럼 이 고품위의 인티앰프인 BAT VK-3000SE는 어떤 소리를 내 줄까? 앞서 말한 대로 너무나도 프리와 똑같이 생긴 이 인티앰프는 결론을 말하자면 생긴 그대로 프리앰프단에 공을 많이 들인 앰프로 보인다. 그래서 요즘 일반적인 하이엔드 인티앰프가 가는 길과는 조금 다르다. 인티앰프이지만 분리형 못지 않은 성능을 내기 위해 힘을 중시하는 쪽으로 방향을 잡고 나오는 경우가 많다. 하지만 이 경우 양보다는 질을 중시하였다는 느낌을 준다. 예사롭지 않은 넓고 깊은 무대가 그려진다. 바이런 야니스의 피아노가 오케스트라의 앞으로 튀어나올 때 일반적인 물리적인 장점, 예를 들면 투명하다던지 파워가 있다거나 엣지가 선명한 이런 느낌이 아닌 조금은 감각적인 느낌, 그 느낌이 매우 고급스럽다. 말하자면 화려한 색상이나 디자인 또는 커다란 명품로고가 아니라 우연히 스친 옆 사람의 코트 감촉이 매우 좋았다, 어떤 브랜드인지는 모르지만. 뭐 이런 느낌을 준다. 이렇게 설명하기 딱히 애매한 고급스러운 느낌은 오래된 음반, 앞서 말한 야니스나 또는 하이페츠의 바이올린과 같은 협주곡을 들을 때 빛이 난다. 기타 물리적인 요소 파워 드라이빙 능력 임팩트 있는 저음은 귀에 잘 들어오지 않지만 역시 거슬리지도 않는다. 굳이 말하자면 이런 것들은 무난한 수준, 평균 이상의 성능을 보여준다. 이 같은 고급스런 표현력은 의외로 재즈 음악에도 좋다. 여성 보컬의 찰진 표현력도 좋지만 콜트레인이나 마일스의 나팔소리가 아주 단아하게 울려준다. 이 경우에도 대단히 강력한 비트의 드럼이다, 또는 심벌이 작렬을 한다 라는 느낌이 감동적으로 다가오지는 않는다. 참 좋은 음색이다 라는 느낌, 연주를 잘하는구나 또는 목소리가 좋다 라는 감흥으로 음악에 빠지게 한다. 어쩌면 이것은 이 앰프의 최대의 강점이자 약점인지도 모른다. 아, 초심자가 선택하기는 힘든 하이엔드 입문기로구나. 이율배반적인 모순되는 선택이다. 하이엔드 입문을 초심자가 하는데 초심자의 취향은 아닌 것 같다는 생각이 든다. 혹하는 임팩트로 첫 음이 귀에 딱 들어오기보다 쭉 여운이 남는 타입이다. 물론 훈련이 된 귀를 가진 분은 금방 이것을 가려내기는 한다. 평론가들과 앉아서 같이 시청을 하면 조금 짜증날 때가 있다. 서너 소절 듣고는 훅훅 시디를 바꾸어 낀다. 한 곡 끝까지 듣는 경우가 드물다. 어설프게 따라 하느라 이런 식으로 듣다가는 겉에 보이는 면만 볼뿐 이 앰프가 만드는 이런 멋진 표현력을 놓치기 십상이다. 요즘 정말 좋은 오디오가 많이 있다. 과거로 말하자면 뮤직센터 급에 속하는 심플하고 예쁜 소형기도 가격을 믿기 어려울 정도의 뛰어난 품질을 내준다. 멍청한 소리를 내는 이전의 보급기들이 아니다. 지금이 그 어느 때보다 저렴하게 음악과 오디오를 즐길 수 있기는 하다. 하지만 만 명 중에 한 명 꼴로 우리같이 특이한 족속들은 그 이상을 원한다. 그리고 그것은 일반인에게 딱히 이해시키기 힘든 면이 있다. 비애호가에게 가장 많이 듣는 질문이 이러면 소리가 크게 나냐는 물음이라는 것은 이 글을 찾아 읽는 사람이라면 누구나 공감할 것이다. 거실 한가운데 대형 TV가 있어야 될 자리를 차지한 오디오를 보면서 이런 질문을 받으면 정말 난감하다. 이 인티앰프는 그런 느낌이다. 소리가 크게 나지는 않는다. Dimensions(WHD) Inches 19" x 5.75" x 15.5"